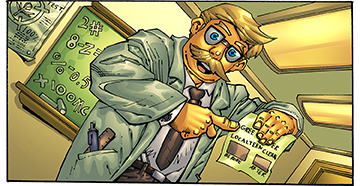 Doctor Terranova was a scientist for Big Corp. His intentions were to use his knowledge to help the planet, however, Mr. Corp twisted the Doctor’s inventions and ideas for profit and power. Doctor Terranova secretly released Cambio, a finger monkey who had been genetically modified, to find and organize the Green Eco Warriors team of Amelia, Juan, Kalil, Liam and Nya. The Doctor knew that the Green Eco Warriors together could fight Big Corp and thwart its harmful, environmental destruction. Due to Cambio’s escape, Mr. Corp kidnapped Doctor Terranova leaving Cambio to train the new Green Eco Warriors’ and carry out their important mission.